I am not even close to the first to make this comparison, and there is a reason for its appearance in beer circles on the web, but at risk of opening a can of beer pandora's box can of worms, I wish to chime in on the Heady Topper vs. Les Trois Mousquetaires Double IPA comparison. Both are hard to come by, with Heady regularly selling out every week within hours of canning in the vicinity of the Alchemist's Waterbury, VT brewery, while LTM's DIPA was released only for one day at the brewery (so far) and sold out in two hours. (Though, its limited availability is assured to be simply because of difficulties in hop sourcing for all 8 varieties in the product, and LTM assures that they will be making more at some point). Both offer waves of hops goodness, with numerous hops varieties infusing each, while LTM is 8.3% and 130 IBU to Heady Topper's 8% and 120 IBU. The similarities don't end there, though some differences exist as well. 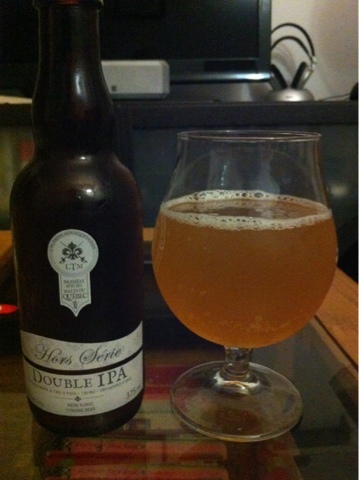 The LTM Hors Série Double IPA pours a hazy orange with but a slight white head of very little retention or lace. The Heady Topper is similar in all regards, but with a more substantial head, less orange and more amber, with chunkier particulate that is somewhat hazier than the bottled LTM, but less hazy than its draught counterpart. The aroma brings the strongest similarity with a bold fruitiness exemplified by citrus (especially tangerine, with some lemon and grapefruit), mango, and a hint of lychee. The nose is actually very similar to HT, but doesn't quite fill the room upon bottle-crack the way it does when a can of Heady opens. In the mouth, it begins sweetly with some lightly bready malt and the sweeter side of the tangerine hops goodness before drying up quickly with a more substantial and longer-lingering bitterness (characterized by grapefruit) than is present in Heady Topper. The draught version of the LTM DIPA presents a spicier earthiness, alongside a touch of honeyed sweetness that I don't notice as much in the bottled version. Either way, it tastes delightful and offers a solid flavour evolution, but doesn't quite get to the complex evolution of hops notes offered by Heady, though it is still very, very delicious. On the tongue, it is medium-bodied with moderate carbonation, while simultaneously feeling a slight bit oily alongside some slight and decent prickliness despite not presenting an overwhelming effervescence. It is a bit warm and the alcohol notes become increasingly present as the glass warms, while this is something HT better tempers. In conclusion, there are many reasons for the comparison to Heady Topper. Appearance, aroma, flavour, and mouthfeel all bear similarities, but the legendary Heady comes out on top overall. That, however, is still high praise for LTM and takes nothing away from its success, since HT currently ranks as the world's top beer on ba and 29th on ratebeer. 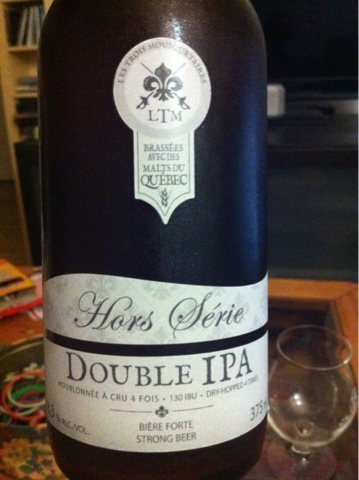 This Quebec gem, however, is further proof (alongside Dieu du Ciel's Morality, especially) that the Quebec and Canadian IPA scenes are evolving - when the necessary American hops can be sourced - and that it truly and legitimately belongs in this discussion is an excellent sign even if it fairly falls behind the Alchemist's masterpiece.